Haut Velo is in the stunning Val de Bagnes in the Canton of Valais, Switzerland, home of the world famous ski resort of Verbier. Verbier village is situated in the Swiss Alps 1500m above sea level and has breath-taking views over Val de Bagnes, the Grand Combin’s imposing glacier and Mont Blanc mountain range panorama. 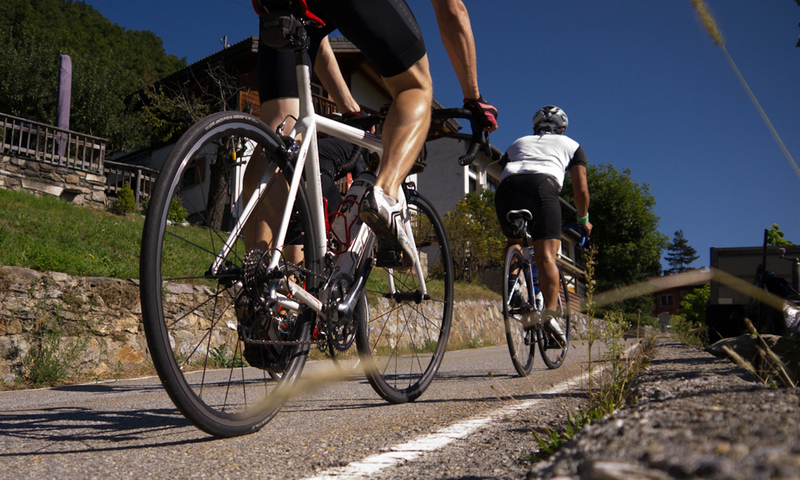 Road cycling is a popular sport in Europe with money invested in its infrastructure. 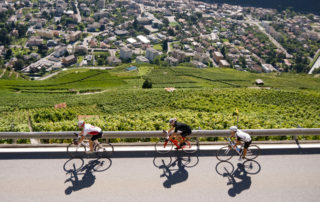 Valais is the home of the UCI headquarters and so the canton has, and is, heavily investing in making itself the capital for road biking in Switzerland. 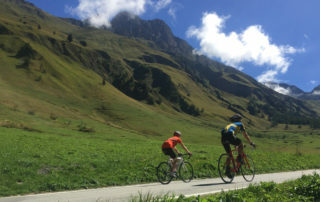 Verbier draws cycling enthusiasts from around the world to tackle the daunting mountain passes – including regular visits from the pro teams during the Tour of Switzerland and Tour de France. 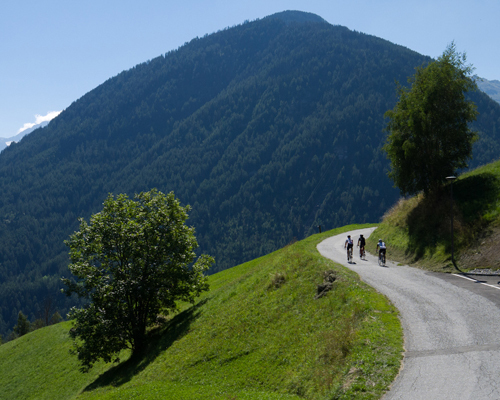 With Val de Bagnes as your base, you have access to some spectacular cycling. 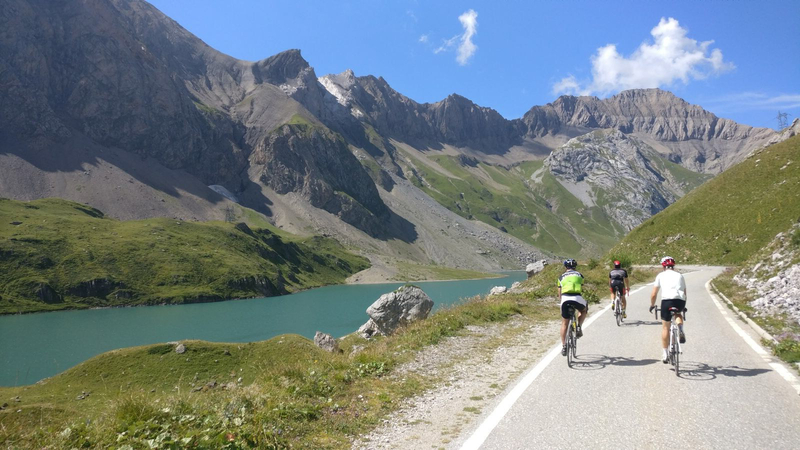 From mountain passes climbing to France and Italy, to flat rides along the banks of the river Rhone through orchards and vineyards. 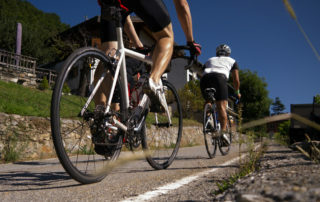 Historic routes meandering through traditional alpine villages and sweeping descents will have your adrenaline coursing. Once off the beaten track the roads are very quiet and generally in good condition. On the whole most drivers are courteous and understanding to cyclists. 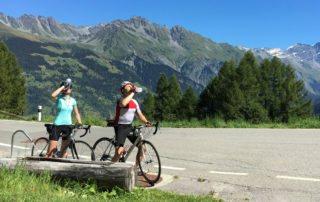 Unlike some other popular cycling destinations, you will not be competing with other cyclists for space on the roads – quite the opposite, you will probably see more Marmots than other cyclists! Along some busier roads there are generally cycle paths or smaller alternative roads running parallel. Verbier is renowned for its world-class skiing and eclectic nightlife. The summer offers the opportunity to sample world class cycling through the spellbinding scenery of the Swiss Alps. The ambience in the summer is relaxed and calm compared to the busy winters. The cafés, bars, restaurants and nightlife offer enough entertainment for thirsty, hungry and dance-keen cyclists. 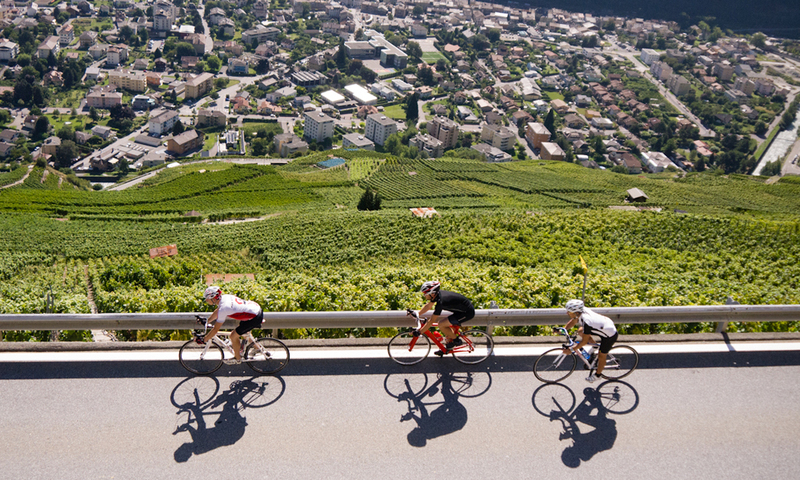 Over the years the pro-tours have finished or passed through Valais a number of times. 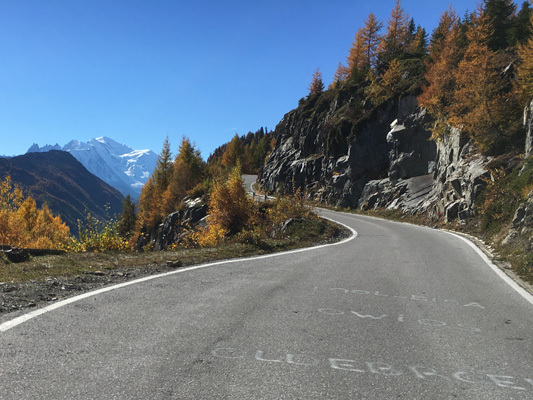 So it’s time to stop shouting at the TV and to see how hard it really is… In 2016, stage 17, headed from Berne, through Switzerland on its way to the French Alps, heading up the Col De La Forclaz (Cat. 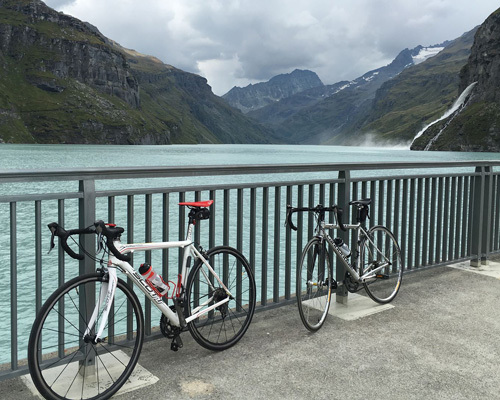 1) before turning right up to the summit finish at the Emosson Dams (Cat. HC) standing at just under 2,000m above sea level. The reward is spectacular views across to Mont Blanc range along with the stunning reflections in the lake water. As well as this, you are warmly greeted by a fantastic terraced café where you can soak up the sun. 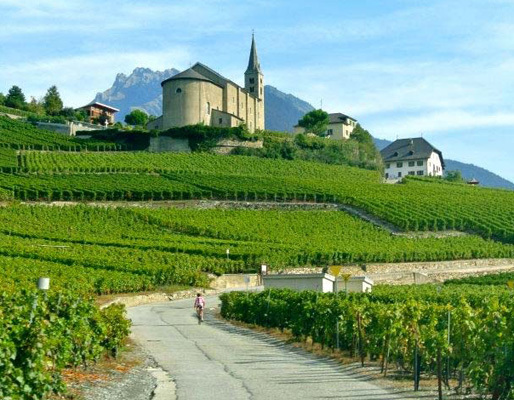 A flat ride through the vineyards, orchards and Swiss villages on the banks of the river Rhone. With the wind behind you, it’s easy to collect a lot of kilometres without realising. Stop for a relaxing lunch at one (or many!) of the vineyards or cafés before carrying on your adventure or being driven back to the chalet. One thing the Swiss do well is very high and impressive dams in amazing mountainous locations. With several to choose from in Valais, why not tick a few off during your week? For example the Mauvison dam, if taken steadily, can be a relaxing climb and scenic ride. Head up the valley through small Swiss hamlets and agricultural villages whilst always shadowed by the huge mountain ranges and glaciers. Keep an eye out as you may bump into one of the friendly local Marmots. The summit is a great location for a bite to eat and some photos. Others may want to explore the museum housed in one of the old work tunnels. 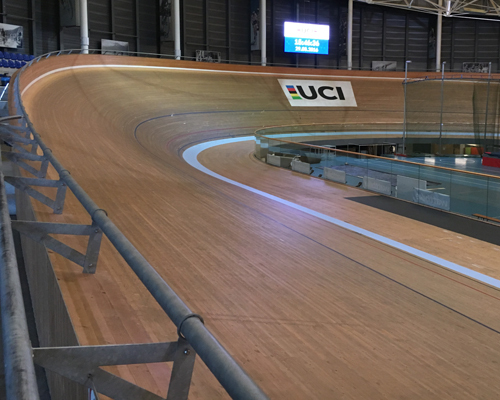 For more cycling inspiration why not visit the fantastic facility that is the UCI’s headquarters? With a world class velodrome and BMX track side by side, you are in for a treat. If you still have energy from your cycling exploits, why not hire the velodrome or the BMX track for a group session? All the equipment and coaching is included. They also have a range of interesting and famous bikes on display for the keen cyclist to ogle! Either take the steady cycle down to the velodrome or save your energy by taking a lift in our minibus. 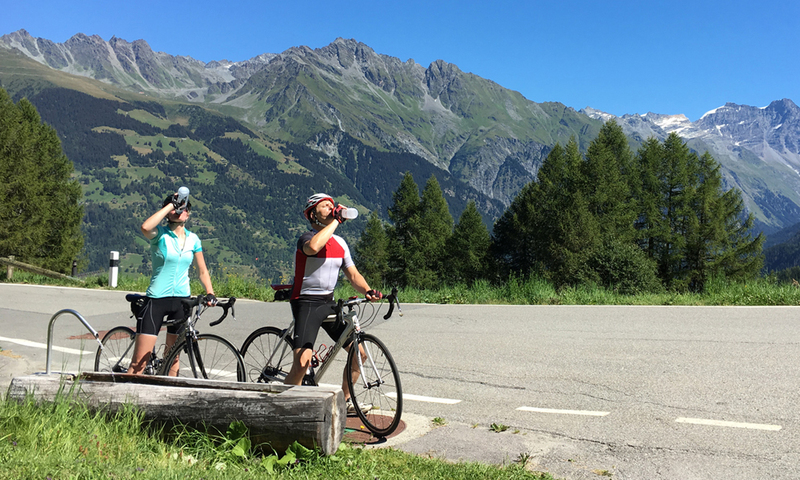 Directly on our doorstep you have a number of fantastic climbs and challenging cols to tackle – Col de Planches, Col de Lein, Col de Champex to name a few. Within a few kilometres you will be on quiet and well surfaced roads heading upwards. Don’t forget … what goes up must come down! Most of the descents are quiet, open and flowing – great for an evening spin to watch the sunset or to link a number of them together to really test the legs. How many can you conquer in a day? Heading up from the Swiss side, the Col de Grand St. Bernard is the oldest pass in the western alps and the third highest road pass in Switzerland – this is a formidable climb and descent. It sits on the border with Italy and is steeped in history and stories ranging from the iron ages, including Napoleon, St. Bernard Hospice, the Romans and the home of the St. Bernard rescue dogs. At the summit of the col are the lake, a number of shops, cafés, a museum and the old hospice. 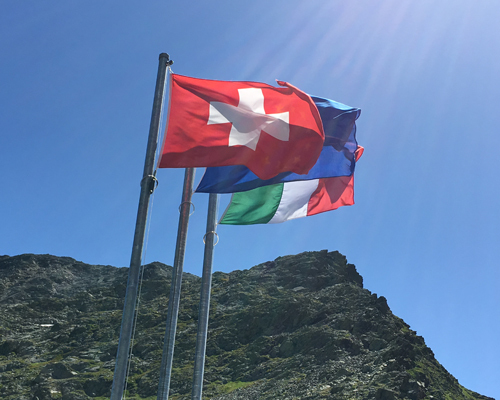 Once you’ve recovered from the climb… which side do you want to drop down into… Switzerland or Italy?